The PAT2 loading ramp is a new product of PROMStahl’s wide product range. This top-quality product benefits from over 25 years of experience in designing and manufacturing docking systems. This ramp is a complete loading system which is mounted in front of a door opening or a building as a self-supporting unit. It consists of a hydraulic dock leveller with a telescopic lip and lateral treads which are reinforced on their bottom side. The PT2 leveller of the PAT2 system is operated at the touch of a button and after exact positioning the telescopic lip automatically follows the movements of the vehicle during the loading or unloading process (automatic floating position). The big advantage of this type of dock leveller is the maximum flexibility of the lip contact length. Thanks to this feature effective loading and unloading even of vehicles that are not completely correctly positioned can be guaranteed and time-consuming and complicated repositioning of the vehicle is not necessary. 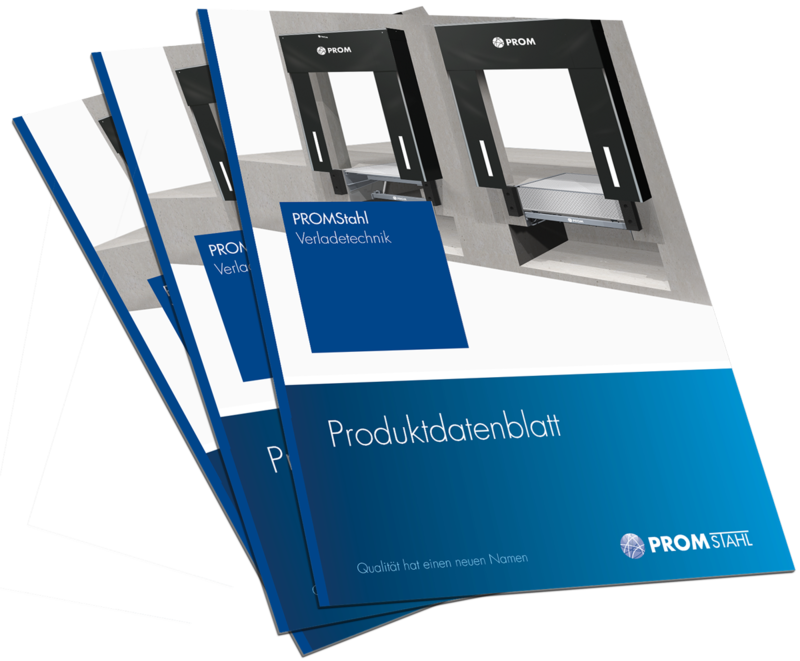 The PROMStahl PAT2 systems suggests itself as an extension to an existing building by means of a loading system as the necessary constructional preparation work is limited and operating costs are reduced. The PROMStahl PAT2 system can be installed at various angles (45°, 60°, 75°, 90°, 105°, 120°, 135°) at the front of the building so that it is possible to optimally utilize the available space and to guarantee smooth and efficient loading and unloading operations. The steel elements of the PAT2 system are available either hot-dip galvanized or painted. The stepped version of the PROMStahl loading ramp enables docking of various types of vehicles and is used when the loading height of the vehicle is lower than the height of the loading station. The stepped version guarantees trouble-free opening of the vehicle doors after vehicle dock-in. As an option the PROMStahl PAT2 system can be extended to form a PROMStahl loading house. The loading house is a cladding house that in combination with a loading ramp and a dock shelter forms an independent unit that can be installed in front of the building and includes all components of a loading station. Together with the loading ramp as the support the dock leveller, dock shelter and sectional door form a complex loading system. The PROMStahl loading ramp meets the latest European standards (DIN EN 1398) and is GS certified. All dimensions in mm. Load capacity for all dimensions: 60 kN (dynamic), 84 kN (static).